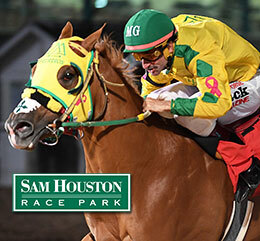 Sam Houston Race Park has set an early post time of 4:00pm (CDT) has been set for Saturday's Sam Houston Futurity trials. HOUSTON, TX—APRIL 8, 2019—The 2019 Quarter Horse racing season at Sam Houston Race Park gets underway on Friday. It will be an action-packed opening weekend with trials for the $35,000 added Sam Houston Derby (G3) (see related story) on Friday night and 15 trials for the $100,000-added Sam Houston Futurity (G2) (see related story) on Saturday. Post time for Saturday has been moved up to 4:00 pm. James Leatherman will serve as racing secretary for the upcoming Quarter Horse meet at Sam Houston Race Park. The Vinton, Louisiana native has a 28-year tenure as a racing office official and joined Retama Park in 2005 as the track’s racing secretary. He will continue to oversee the Thoroughbred and Quarter Horse meets at Retama Park in addition to his Sam Houston Race Park duties. Friday and Saturday post times for the 2019 Quarter Horse Meet will be 7:00 pm (Central) with matinee racing offered on Monday afternoon at 12 noon. There will be a special post time of 1:00 pm for Kentucky Derby Day on Saturday, May 4 and the simulcast of the Preakness Stakes on Saturday, May 18. The 20-day meet continues through Saturday, May 25. Fourteen stakes will be contested in the 2019 live Quarter Horse racing season at Sam Houston Race Park. Here are the dates of the trials and stakes. A complete list of the 2019 Quarter Horse schedule is available on shrp.com. Sam Houston Race Park is Houston’s premier racing and entertainment facility, located just 15 miles from downtown Houston. The Park offers a variety of attractions including our Suite Level featuring luxurious suites overlooking the race track and accommodating groups from 20 to 300 people, The Pavilion Centre, and award-winning dining options at the Winner’s Circle Restaurant and the Jockey Club. For more information on upcoming shows, events and tickets, please visit shrp.com.